You can use any picture you load onto your iPhone or iPod touch as your wallpaper (the image you see when you awaken your device from Sleep mode). 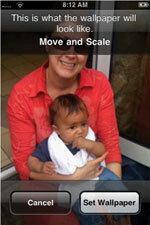 Open Photos, tap on the desired picture, and then tap the options button in the lower left corner of the screen. Then tap Use As Wallpaper, and the “Move and Scale” screen will appear where you can move the image up or down or zoom in on it (by touching and spreading your fingers) until the picture appears as you want it to. When you are ready, tap Set Wallpaper. You can search on and play YouTube videos on your iPhone or iPod touch, but trying to watch YouTube videos over AT&T’s EDGE network can be agonizingly slow, and may not be doable at all. If possible, limit your YouTube watching to only those times when a Wi-Fi connection is available, which will make it a much more enjoyable experience. 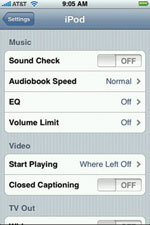 To transfer music, video, and other content to your iPhone or iPod touch, you must sync with iTunes. Once you have disconnected from iTunes, you cannot delete the synced content directly from the device. You must reconnect to iTunes, deselect the content you want to remove in iTunes, and re-synchronize. This tip is particularly useful for music videos, allowing you to listen to the music without watching the video. 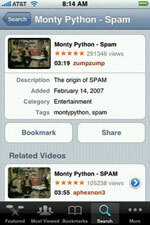 Instead of selecting the item from the Video list, tap on the Songs or Artists icon and tap on it in those lists. Some videos on the iPhone or iPod touch have horizontal or vertical black bars bordering the screen. This is because the original composition of the movie or video is too wide or narrow to fill the screen. If you want to have the video fill your entire screen, simply double-tap anywhere on the screen, and the video image will zoom in slightly and magnify the screen so that there are no black bars. Double-tap on the screen again to return the screen to its original configuration. If you’re using the headset that came with your iPhone to listen to a video, you can control playback with it. Click on the mic button once to play or pause a video (or song). Click on the mic button twice to go to the next chapter in the video (or the next song). If you want to get to a particular date quickly in Calendar, simply tap and hold on the forward and backward buttons next to the day or month in the Day or Month views—the dates will fly by in no time. To get back to the current date, tap the Today button. 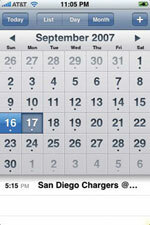 Set birthdays, anniversaries, and other recurring meetings as repeating events. From the Add Event screen, tap on Repeat and select from Every Day, Week, 2 Weeks, Month, and Every Year. You might set the Alert time a day or two before birthdays and anniversaries to give yourself time to get a present. Set the alert to give you plenty of time to prepare for an appointment. 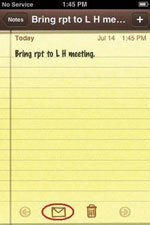 If the meeting is out of the office, set the alert to give you time to travel to the meeting. You can sync music and videos as well as Contacts and Calendar information with your PC or Mac, but you cannot sync notes. If you want to transfer a note to your computer, tap on the envelope icon at the bottom of a note and e-mail it to yourself. Then open it on your computer and cut and paste it into the appropriate application. The best way to avoid this is to write down your passcode and keep it somewhere safe. If you don’t do this and forget your passcode, you’ll have to connect your iPhone to your computer and use iTunes to restore the iPhone software. This will wipe out Contacts or Calendar info you have on the device, along with any music or videos on the device. You can then sync it with your PC or Mac to get the info and files back on.